This morning EJ and I went to the Secretary of State–in other states called the Department of Motor Vehicles–to get a license plate for the “new” Suburban and get the title in our name and all that sort of thing. EJ also called the insurance agency in the Emerald City to get the Sub insurance, and transferred all our vehicles to their agency. They remembered that when we asked them to insure our new house, the agent down south had a horrible unprofessional fit, even calling the corporate office to complain that the northern agency was “poaching” his clients, which was not the case at all. EJ called the old agency today to tell them we were transferring our vehicles to the northern agency. Our agent wasn’t available so he talked to an assistant who said he understood that we were moving everything up here because our life is moving up here. However, the owner of the agency wants to talk to EJ and I’m sort of expecting–and preparing for–unpleasantness. I was almost out of cat food so while EJ put the new license plate on the Suburban, I went to the nearby grocery store that was located in the same plaza as the Secretary of State office. I had never been to this particular grocery store before. There is a nice little grocery store closer to us that I often go to, but this other store was a bit bigger and had more items and more variety so I will probably do some of my shopping here–at least until the much bigger grocery store that is being built is completed. It’s nice to have a selection of grocery stores not too far away. After we had bought pet food and a few other things, we drove to Anatevka, which is “our” town, and stopped at the post office to mail the old license plate back to EJ’s nephew. He nicely let us borrow it until we could get our own license plate. We then went to the hardware store a few miles away to get a large garbage can with a lid so we could securely store Danny’s food in it. We are trying to get a surplus of necessities. I don’t want to run out of pet food or other essentials when we get snowed in this winter. Today was really hot–the hottest day we have experienced so far in the Enchanted Forest. We opened the windows and turned on all the fans. Still…it doesn’t feel as hot as it did in the south. The lakes keep things cooler and less humid here in the north, and we have a nice breeze. JJ building his computer in the garage. JJ used his earnings to order computer components so he could build a really nice gaming computer, which he has always wanted. 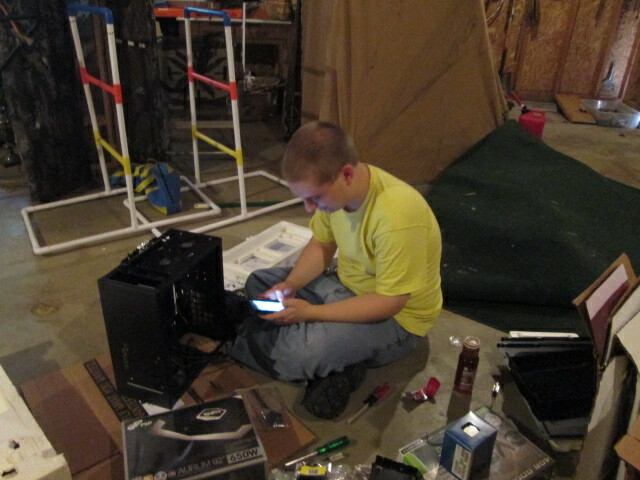 The last of the items arrived early this afternoon so he set up a spot in the garage to build his first computer. Since JJ had never done this before, a friend talked him through it, step by step, over the phone. JJ has been working with determination in the hot, stuffy garage for hours and hours. Sometimes he’s gotten a bit discouraged, sometimes he’s been exultant, he’s tired, but he’s still at it. I’m proud of him and glad he is working at something he is interested in. For the last few weeks, EJ and I have been hearing a mysterious flute-like song echoing in our Enchanted Forest. We have wondered what bird was making such a hauntingly beautiful sound–the most beautiful bird song we have ever heard. However, since we never saw it, we didn’t know how to identify the singer. I was beginning to imagine it wasn’t a bird at all, but maybe some beautiful mythical creature wandering through our forest playing her magic flute as animals scampered around her. EJ and I looked through our Michigan Birds book to try to pinpoint birds that might sing like flutes, and then we went to the Cornell Lab of Ornithology – All About Birds website to listen to bird songs. Cornell has a wonderful site filled with pictures, information, and audio of various bird songs. Still, it’s difficult to identify a mysterious bird that we’ve never seen. Then I came across a page on their site called How to Listen to a Song, which advised beginners to listen to the rhythm, pitch, repetition, and tone of a bird song. They gave audio examples of each. Under “tone” there were examples of whistles, harsh sounds, trills, mnemonics, and liquid or flute-like. Flute-like! I listened to the examples and found the song of our mysterious forest flutist! It is a Hermit Thrush. 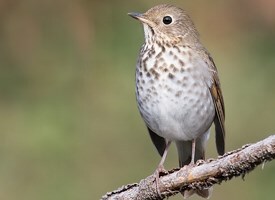 The website says that it is “An unassuming bird with a lovely, melancholy song, the Hermit Thrush lurks in the understories of far northern forests in summer and is a frequent winter companion across much of the country. It forages on the forest floor by rummaging through leaf litter or seizing insects with its bill.” How cool to be able to identify the birds who sing so beautifully! 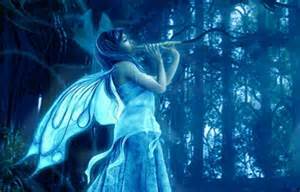 I’m so glad we can enjoy the fluting melody in our Enchanted Forest. Now we just have to identify the other songs we hear…. Oh, when we crossed the Mackinac Bridge, we saw Cormorants for the first time. Wow it was great to hear that bird. It sure does sound like a flute. Enjoy, and great for JJ. He will love that component when he is finished especially knowing he did it himself.